Alyssa Milano, famous these days for being part of the resistance rather than for any box office hit, took the news that Ruth Bader Ginsburg went to the hospital badly. As did much of the left – the gallows humor quickly spread as they realized taking the House fell far short of what they needed. They were celebrating until they realized that the Senate has way more power than the House and Trump and the GOP are tighter than ever. Milano tweeted out some serious gallows humor and a joke most consider to be in absolute poor taste: “Ruth Bader Ginsberg can have my ribs. And my kidneys and a lung. And anything else she needs. 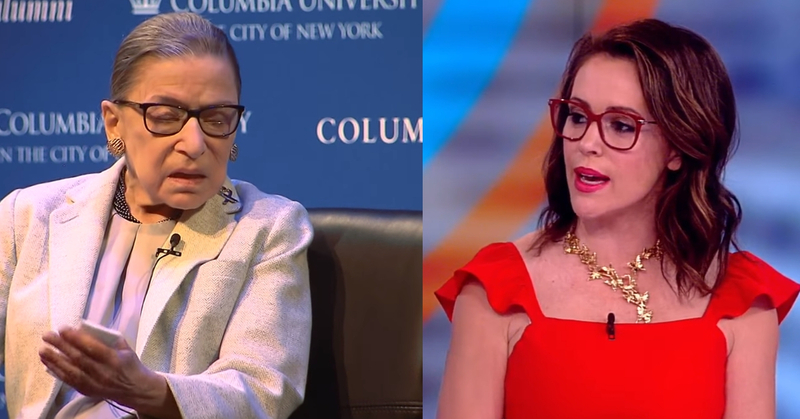 She can even have my husband on Thursdays.” Earlier the news rocked the country when it was leaked that Ginsburg suffered a fall and as was admitted to the hospital. This is not the first health scare that Ginsburg has suffered and she is actually in quite good health. Can you imagine what would happen if Trump got to pick another Supreme Court judge? From The Hill: Justice Ruth Bader Ginsburg, the court’s leading liberal, was admitted to a hospital Thursday morning after falling in her office. The Supreme Court’s Public Information Office said in a statement that Ginsburg, 85, fractured three ribs on her left side in the fall. She is being treated at George Washington University Hospital in Washington, D.C. The court’s press secretary, Kathy Arberg, said Ginsburg fell in her office Wednesday night. The Brooklyn-native has said that she plans to serve on the court until she is 90, and has hired law clerks through 2020.